In Barcelona, Bayern Munich, Real Madrid, and Juventus, there’s nothing subtle about the four Champions League semifinalists. The first three are the defining powerhouses of the current football age, and although Juventus may have been absent from the deeper reaches of the Champions League in recent years, they just won their fourth domestic title in a row and their 31st since Serie A officially began in 1929. The Italians might be the underdogs in this group, but they certainly belong among the elite of European soccer. What makes this particular edition of the Champions League so intriguing is that all four teams play distinct styles, and that’s not always the case. In last year’s semifinals, Chelsea and Atlético Madrid squared off in the battle of the determined defenders. The year before, Bayern Munich beat Borussia Dortmund in a finals matchup that saw the German giants implement a strategy built on aggressive defending and quick transitions that had been returned to prominence by Jürgen Klopp, manager of the very Dortmund team they defeated. This year, each semifinalist has its own way of playing. Can Barcelona’s defend-and-counter attack conquer their old manager? Can Bayern Munich do possession better than Barcelona used to? Can Real Madrid rediscover their superstar super-system from earlier this season? And can Juventus survive one game without a certain world-conquering midfielder? We’ll find out those answers over the next two weeks, but do you really want to know who’s going to win the Champions League? It’ll be whatever team figures out how to do what it does best better than everyone else — and finds some luck along the way. Until recently, Real Madrid, unlike Barcelona and Bayern Munich, hadn’t shown the ability to change their style or approach. And for long stretches, the inflexibility hasn’t mattered. Real Madrid president Florentino Pérez has handed manager Carlo Ancelotti a gaggle of attack-minded stars and basically said, “Here, now go figure this out.” As he has at every stop of his career, Ancelloti, a three-time winner of the Champions League, did just that. But it wasn’t easy — or sustainable. Ancelloti’s star-fueled system relied very heavily on the extremely specific skills of six attacking players — Cristiano Ronaldo, Gareth Bale, Karim Benzema, James Rodríguez, Luka Modric, and Toni Kroos — in addition to Marcelo at left back and a pair of very mobile center backs. (The right back, usually Dani Carvajal, but occasionally Álvaro Arbeloa, isn’t asked to do much more than “defend.”) Ronaldo played mostly as a second forward next to Benzema but also as kind of a non-defending left winger. Bale played as a right winger who also had to double as a right midfielder whenever the opposition had the ball, while Rodríguez shuffled from central attacking midfield to left midfield as possession changed hands. The trick to such a lopsided approach was that they transitioned into an attacking shape at a lightning-quick pace and didn’t allow opponents sustained possession. A midfield that amounts to a flat line of Bale, Modric, Kroos, and Rodríguez just can’t hold up defensively against even the worst La Liga teams. But with so much firepower, Madrid didn’t have to do much defending, as they were able to pin teams back with wave after wave of attack quarterbacked by Modric, who is one of the best in the world at transitioning teams into flowing attacking moves. However, after injuries to Modric in November and to Rodríguez in February, Madrid’s form dipped. It’s not that Real Madrid’s backups, players like Isco and Asier Illarramendi, are bad, but they simply don’t have the same skill sets as Madrid’s first-choice stars. And it’s those skills that made Madrid tick. After a brief return to full health last month, Madrid are in the midst of another injury crisis. Bale was hurt but played over the weekend and Rodríguez is back, but Modric is out again, and he’s now joined by Benzema on the sideline. While that’s only two missing players, the system needs all of the first-choice front six to hum as efficiently as it did earlier in the year. Except, Real Madrid don’t spend a gazillion dollars just to responsibly batten down the hatches when a player or two gets hurt, so for a while Ancelotti just tried to plug in replacements. It wasn’t until Bale, Benzema, and Modric were all out that he finally opted for a new approach. When Real defeated crosstown rivals Atlético Madrid in the quarterfinals, Ancelotti fielded a team with a goal-poaching striker in Hernández, who doesn’t have the more well-rounded attacking game of Benzema; a third central defender, Sergio Ramos, manning the midfield next to Kroos; and a band of three attacking players — Ronaldo, Isco, and Rodríguez — between them. That’s a pretty traditional 4-2-3-1 setup, and against Atlético it resulted in a pretty traditional-looking goal. In a tricky road match against Sevilla, Ancelloti used the same lineup en route to a 3-2 win. Now, Madrid aren’t a better team for the changes: A full-strength Real Madrid in full flight is truly a thing to behold, and you don’t just lose all of that talent and improve. But there’s a reason the win over Atlético was their first in a whopping eight tries this season. Sometimes uglier soccer just works better than the alternative, even if the players executing it aren’t quite as good. So what does this all mean for the semifinal matchup with Juventus? For what seems like the first time all season, Ancelotti has a tactical decision to make with his lineup. Swap Chicharito in for Benzema, Isco in for Modric, and try to replicate the early-season offensive Death Star? Or opt for the more traditional but still star-studded setup of the past few weeks? Given that Juventus’s biggest weakness is probably their somewhat mistake-prone defense, chasing that sweet, free-flowing attack makes some sense. Get the ball up front and get at the back line before Juve’s reinforcements have time to arrive. But that also means playing the somewhat insubstantial midfield — if anything, Isco’s less defensively able than Modric — against Juve’s midfield, which is their strength. Instead, why not drop Ramos in there, be combative on the road, take your chances if you get them, and make sure you get back to the Bernabéu in good shape for the second leg? Most teams have sorted out these types of lineup questions at this advanced point in the season, but since Real Madrid have spent so much time locked into the one mode that their talent demands, it wasn’t until April that they actually experimented. After this past weekend, it seems likely Ancelloti will stick with Ramos in the midfield. If Bale is healthy enough, he could replace Hernández alongside Ronaldo. While that would be logical, it’s also relatively untested, which isn’t exactly the ideal description of a team trying to win the Champions League. Paul Pogba is the best player on Juventus, and although it’s unlikely he’ll be available for the first leg of the semifinal against Real Madrid, we’re going to talk about him anyway. Most soccer players, even the best ones, fall into one of two categories: finesse or physical. If a guy is great on the ball, he’s mediocre when the other team has it. If he’s great on defense, maybe it’s at the expense of a silky first touch or clean ballstriking ability. This dichotomy occurs both because soccer is, well, really hard, but also because most positions on a soccer field don’t actually require a player to do everything. Even if Lionel Messi were the best defensive midfielder ever born — and, frankly, I’m not willing to rule that out — we’ll never have the opportunity to see him anticipate an outlet pass and break up play. It’s not a skill required of top-of-the-formation attackers. Now, the most notable exception to this rule is the all-around midfielder: With equal doses of attack and defense, the only limits placed on what he can display are his own talents. Which, when it comes to Pogba, is to say “no limits.” He can do anything on a soccer field. Seeing sizzle reels full of ridiculous dribbles and breathtaking assists isn’t abnormal, but you won’t find any on the Internet where the ball starts at an opponent’s feet — unless you’re watching Pogba’s. He might be the only player in the world right now who can single-handedly change a game both in attack and defense. Oh, and he’s 22 years old. What makes Juventus such a fascinating team is how their midfield has evolved to revolve around Pogba. This is the Frenchman’s third season with the club, and over that time, the team’s midfield makeup — Arturo Vidal, Andrea Pirlo, and Pogba — has remained fairly constant. What’s changed is how the team’s play first centered on Pirlo, then on Vidal, the Chilean Energizer Bunny, and now on Pogba. Since the players have remained the same, it’s easy to miss how the approach has shifted. Antonio Conte, who managed the team from 2011 to 2014, built a side intent on dominating lesser opponents. Given that Juventus are by far the best team in Italy — and that the rest of Serie A was busy aiming loaded weapons at its own feet — it made sense. The team dominated the ball, using their active all-around midfielders to shield the pass master, Pirlo. At times, Pogba and Vidal acted like an offensive line does in front of its quarterback. Their ability to win the ball back and drive forward into space gave Pirlo enough time to work his passing magic. While Conte left unexpectedly before this season, the wide-ranging skills of Pogba and Vidal meant Pirlo’s influence had already begun to wane. Teams started to aggressively mark the Italian, but that just created more room for the midfielders in front of him to terrorize opposing defenses. 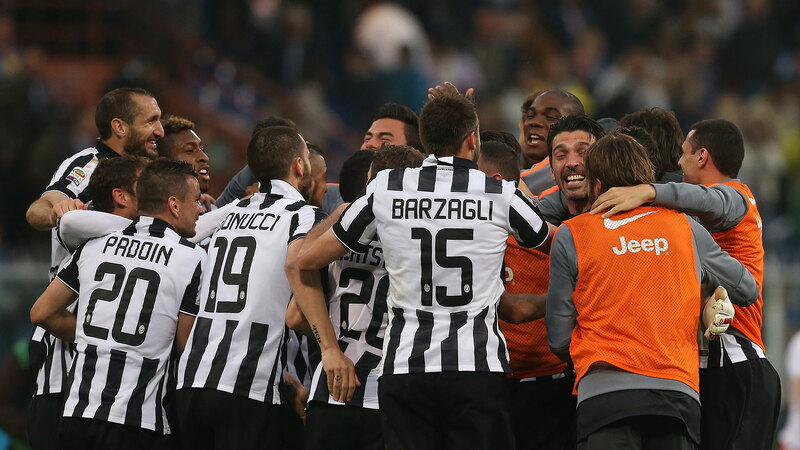 This season, under new manager Massimiliano Allegri, the change has been obvious. Now 35, Pirlo is no longer a lock to start — Allegri will often opt for a third tireless midfielder in Juve veteran Claudio Marchisio or the 24-year-old Roberto Pereyra — and even when he’s in the lineup, he functions more as the designated hitter than the fulcrum. Pirlo’s still as lethal as ever from set pieces and launching counterattacks, but gone is the era when Juve’s entire attack ran through him. If Conte’s vision was to protect a sometimes suspect defense by making sure opponents never had the chance to even try to attack it, Allegri operates the opposite way. He trusts that Pogba, Vidal, and a revitalized Carlos Tevez will be enough for his team to find a goal — and in the meantime, he’ll focus on reinforcing the defense. In other words: Conte wanted to blow you away; Allegri is happy to Milton Berle it. Both methods got results in Serie A, but Conte consistently came up short in the Champions League. Was it bad luck? Or was it a team that was unable to impose itself on a higher caliber of competition? As it usually does, the truth lies somewhere in the middle. Allegri has done better so far in Europe, but he hasn’t faced a challenge like Real Madrid. At this point, the team’s biggest accomplishment is beating a Borussia Dortmund team in a down year. If Juventus and Real Madrid were fully healthy, this match would have been a fascinating case of “styles make fights”: the unparalleled physicality of Juventus’s midfield versus the finesse of Madrid’s, and the breathtaking attacking transitions of Madrid versus the shut-up-shop Juve defense. But with both teams missing key players, the matchup should become less dynamic and more cagey. (“Cagey” is soccer-speak for “boring and defensive.”) Without Pogba, the concern for Juventus is that the attacking moment of genius might never come and that extra care will be needed to make sure Pirlo’s defensive limitations aren’t exposed. Then again, as we’ve already talked about, Madrid might also be happy not to take risks in the first leg, instead content to wait, get healthier, and go back home to Spain to put their mark on the matchup. Plus, if Juventus can’t create without Pogba, why help them by pushing the envelope? If Juventus are going to upset Real Madrid, it will almost certainly be on the back of a magical moment supported by smart team defending and perhaps an opportunistic counterattack or two. In other words, they’ll need to do it like Italian teams have been doing it for generations. And if Pogba makes it back for the second leg, he’ll super-charge that approach. Whether or not his return will ultimately be enough to push Juventus over the top, the opportunity to watch Pogba playing for a spot in the Champions League finals is all we can really ask for. For as unique as these sides are, this side of the bracket is essentially the Pep Guardiola bowl. Before leaving the club in the summer of 2012 and joining Bayern Munich a year later, Guardiola built Barcelona into an era-defining juggernaut. 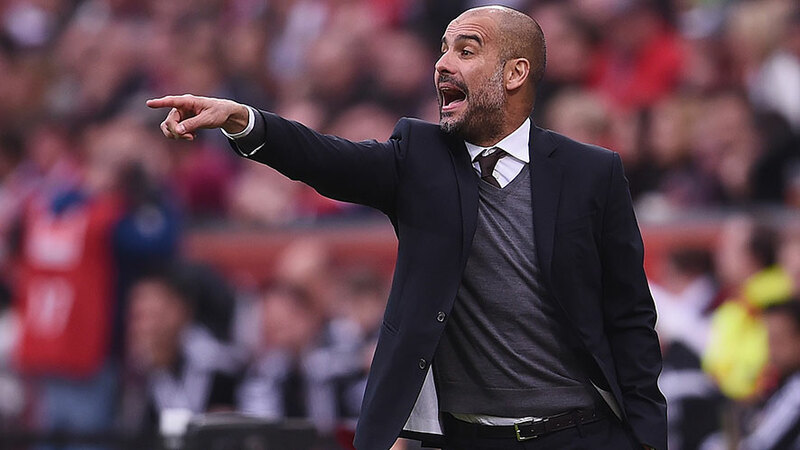 But two fundamental things have changed since Guardiola’s glory days in charge. 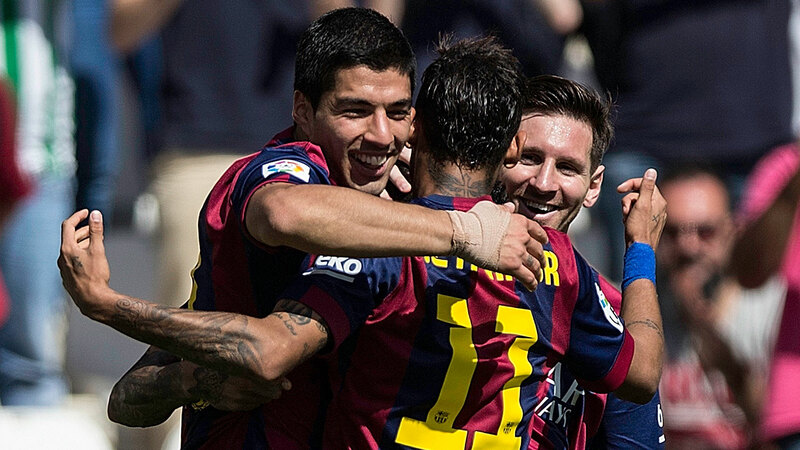 First, Neymar and Luis Suárez arrived in successive summers to join Messi as part of a star-studded front line. And second, when Luis Enrique took over as head coach last summer, he recognized that Barcelona needed something else in order to fully take advantage of the megawatt attacking power up front. Guardiola had built a possession machine, and Enrique replaced the engine with one that has an extra counterattacking gear. Barcelona now have two fundamentally different modes of play. The first is their traditional tiki-taka style that emphasizes possession and controlling the middle of the field. If you’ve watched Barça in the past, you know this approach well: death by 1,000 passes. Even though their traditional midfield quarterback, Xavi, has largely been relegated to a reserve role as he enters the twilight of his career, the Catalans — now with Ivan Rakitic in the Xavi role — are still close to unparalleled at ruthlessly exchanging the ball in the middle of the field. Messi can drop deep to combine with Rakitic and Andrés Iniesta and help break through opposing midfields. However, given that they’re playing the Bayern Munich possession machine this round, the second gear is likely to be more important for Barcleona over the next two weeks. In addition to traditional ball-control mode, Barcelona now have one of the most lethal counterattacks in the world. Instead of always dropping deep to combine with Barça’s midfielders, Messi, Suárez, and Neymar will often stay high up the field and then pounce on defenses as soon as they get the ball. In a given match, the easiest way to tell what Barcelona are trying to do is to watch their front three when the team transitions from defense to attack. When they want to play the possession game, Messi in particular will drop very deep to help facilitate possession in order to give the rest of the team time to get upfield. In addition to the attacking flexibility, Barcelona’s two gears allow them to vary their defensive approach. If this team has a weakness, it’s that the desire to counterattack sometimes writes checks that the defense can’t quite cash. Inviting pressure is essentially making a bet on yourself: You’re wagering that you exploit the space your opponent leaves before they exploit the opportunities you invite them to take. One of the rare times Barcelona’s looked vulnerable this year was on April 11, when they blew a two-goal lead to tie Sevilla on the road. In that game, they simply couldn’t handle Sevilla’s fast attacks or make up for them with counters. Essentially, Barcelona lost the bet. As he’s done all season, Enrique quickly learned his lesson. When a similar fate threatened Barcelona the next week against Valencia at Camp Nou, they took the lead and shut it down. Up 1-0 at halftime thanks to a missed penalty from the visitors, Enrique, somewhat counterintuitively, decided to stop counterattacking and start possessing. He brought on another midfielder, and his side passed its way to a comfortable 2-0 win. Despite the Valencia result, Barcelona typically dominate the ball until they score an opening goal, and then they counter the hell out of an opponent that now has to try to score. That dynamic will be different against Bayern Munich. Guardiola’s new club’s emphasis on possession likely means the Barcelona counterattack will be in play from the jump. And there’s something fitting about that. In order to beat the old boss, Barcelona must fully transform into what he loathed: a defending and counterattacking team. Thanks to Enrique, they’re ready to do just that. Bayern Munich aren’t so much a club as they are a mad scientist’s workshop. That’s not a slight; in fact, it’s exactly what the Munich brass wanted when they hired Guardiola the summer after they won the Champions League, domestic league, and domestic cup. Bayern are one of the richest clubs in the world, and by bringing in Guardiola right after a record-breaking season, it signaled a desire for the club to not only win, but to win by playing a specific style. In that 2012-13 season, Bayern were the best counterattacking side in the world, so, as one does, Guardiola decided to turn them into a possession-based machine. That’s because everything about Pep’s managerial philosophy hinges on his side having the ball. Sometimes you have the ball for defensive purposes — like an effective ground game in the NFL — because it keeps the other guy from scoring. Other times, as poor Porto found out a few weeks ago, it’s about ruthlessly creating goal after goal after goal after goal. Now, it’s tempting to look at Bayern’s insistence on having the ball as evidence they can only play one way, but it’s more accurate to say they can only play one style. When Barcelona shake up their play, they do it by shifting between two fundamentally different possession and counterattack modes. When Bayern mix things up, it’s all under the umbrella of possession. The easiest place to see Bayern’s differing approaches is in their home/away splits. Over the last two seasons in the Champions League, the German club has played 11 home games and 11 road games. Over those 22 matches, they’ve consistently shot more at home (22 shots per game) than on the road (16).1 As you’d expect based on those shot numbers, they also play more passes in the attacking third at home, attempting 241 and completing 187 per game, as opposed to 224 attempted and 181 completed on the road. What’s surprising is that Bayern actually play more total passes when they’re away from home, attempting 782 and completing 685, compared to 729 attempted and 630 completed at home. Those numbers paint the picture of a team that keeps the ball without much forward impetus when away from home. But when you go to Munich? They use the ball to rip you apart. Unfortunately for Guardiola, his team isn’t quite healthy. Ribéry won’t be ready for game time, and Robben is out for the season. Lewandowski broke his jaw last week but hopes to be back, masked up, and ready to go. Meanwhile, they’re just as thin on the defensive side of the ball, with center back Holger Badstuber out for the season, David Alaba, who gives Bayern the same sort of versatility in defense that they have in attack, still sidelined, and Mehdi Benatia only recently regaining full fitness. Given the injury list, it’s possible Javi Martínez, who, though very good, has played once since tearing his ACL in August, could feature in the match. He was part of the heavily rotated team — which included Gianluca Gaudino, Mitchell Weiser, and Rico Strieder2 — that lost to Bayer Leverkusen on Saturday. This isn’t to award Bayern any sympathy points. Again, they’re one of the richest clubs in the world, and they still have exceedingly talented and expensive players to rely on. But instead of being able to choose his squad with the intention of exploiting an opponent’s weakness, Guardiola’s now doing damage control. The reason Müller is starting at striker isn’t because of a tactical decision to exploit a certain kind of center back; he’ll start there because he’s got two working legs and a non-broken face. Typically, Bayern’s biggest weakness is how vulnerable they are to errors from their defenders. Since Guardiola’s teams need the ball, upon losing possession, Bayern will immediately press opponents in order to win it back. That requires defending in the opponent’s half, which then requires Bayern’s central defenders to push up but also cover tremendous amounts of ground behind them. Should they make a mistake with or without the ball, there’s very little protection. That’s how Porto scored all three goals in their opening leg against Bayern last round, as Dante, Jerome Boateng, and Alonso were all victimized on separate ocassions. And in case you need reminding: Porto’s front line is a far cry from Barcelona’s. So, given the ragged squad list and the opponent, it’s difficult to envision a scenario in which Bayern go out and look to attack Barcelona during the first leg in Spain: The more they attack, the more likely they are to lose the ball and leave the defense exposed against the vicious Neymar-Suárez-Messi trio. Instead, they can kill Barça’s game by keeping the ball and slowing down the pace. Then they can go back home with a healthier squad and actually try to win by scoring some goals. If Bayern beat Barcelona, it’ll be thanks to their defending. They’ll just have the ball when they do it. All stats courtesy of ESPN Stats & Info. These are all real names.